Are you having fun being a Auntie!!! Pretty scarf. Hope all is well! 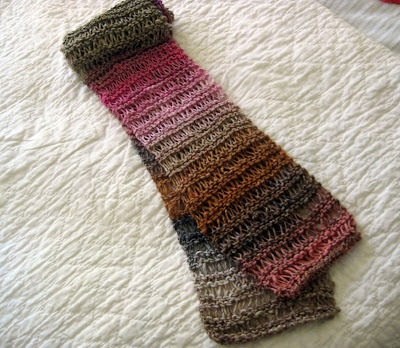 Beautiful scarf and I can't wait to try the pattern! We have missed you! 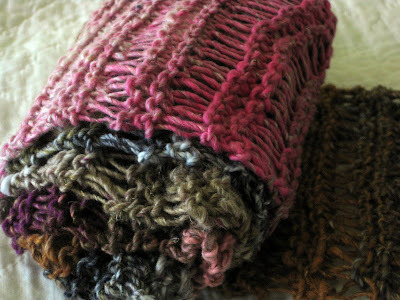 VERY pretty Stacy -- I love Noro yarn! It's so pretty and I love the photo with your cat! I hope you are well. SOOOOO beautiful, looks soft:) Have a blessed day dear friend! HUGS! Because according to your instructions, you insert the needle, wrap around, and then finish the stitch. My sister made a spectacular scarf with the technique in the video and I was just wondering if it's the same technique you used in the scarf or if it's different. I like doing this pattern with two different yarns. It is really pretty! 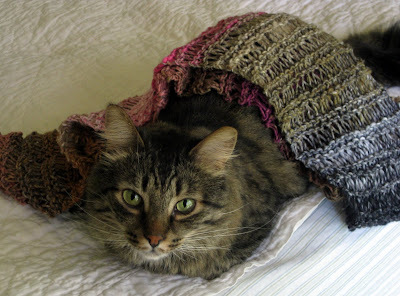 Hi Stacy, I love this scarf pattern and have decided to knit it using a magic ball I am in the process of making up. Loved your model - looks just like one of my fur babies. brilliant idea for using up the odd bits of left over Taiyo I have from cardigan/tops I've made. Always looking for something new and easy and different.